A few years ago I remember having talks with Polycom and Tandberg (now Cisco) about when they were going to commercialize a service that would enable their terminals to place a video call to a mobile. I was always informed that these firms “couldn’t see any demand for it” despite unanimous agreement that there couldn’t/wouldn’t be any until they made it available. 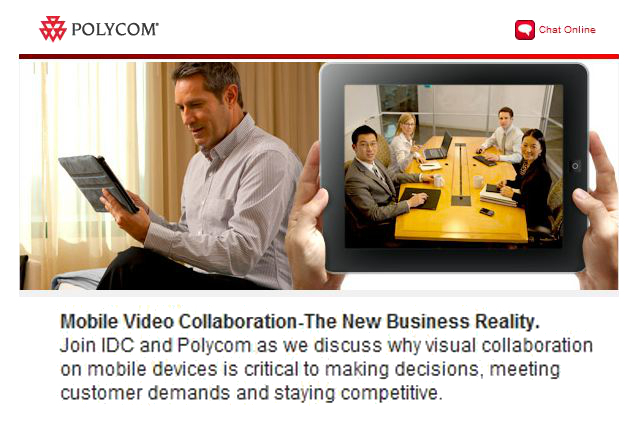 Fast forward to today and I’m invited to Polycom’s latest webinar titled “Mobile Video Collaboration – The New Business Reality” it promises to “discuss why visual collaboration on mobile devices is critical to making decisions, meeting customer demands and staying competitive”. Look closely at the image and you’ll notice a bunch of execs boasting a BlackBerry, a circ 2005 laptop and some pens and paper. The last time I was in a corporate boardroom that had that tech on the table it was probably… …well 2005. Driven by consumer adoption of video mobile technology execs who conduct meetings in boardrooms that are equipped with expensive integrated video conferencing equipment are all now bringing their own video smartphones, tablets and laptops with integrated webcams.